Way back in the middle of February—you know, two and a half months ago—I came home to a bathroom ripped of tiles, with the toilet sitting in the middle of our living/dining area. That was 12 (count 'em), 12 weeks ago...Never in my wildest home-renovation dreams (which, you know, can get so, so wild) did I imagine it would take this long to finish up the teeny, tiny bathroom in our main floor. But you never realize just how long a project will take when you begin. Considering weekends spent away from the house, having to specially order materials, calling in a handyman to help on some of the more intricate details and just working on everything in the littlest increments, the project took about five times longer than anticipated. Good grief am I glad it's over. First, I have to apologize for the less-than-stellar photos...I've been trying to get the new bathroom in some fresh daylight, but the sun has been absent from Wisconsin skies for about a week straight, and I just didn't want to leave you hanging for optimal sunlight. Also, a 6'x4' space is pretty much impossible to photograph. So you're going to get a whole bunch of broken-up pics to try to show you the whole space. Anyway, I love the new bathroom. Our home was built in the 1950s, so I like that we've kind of thrown things back to fit the era of our house. 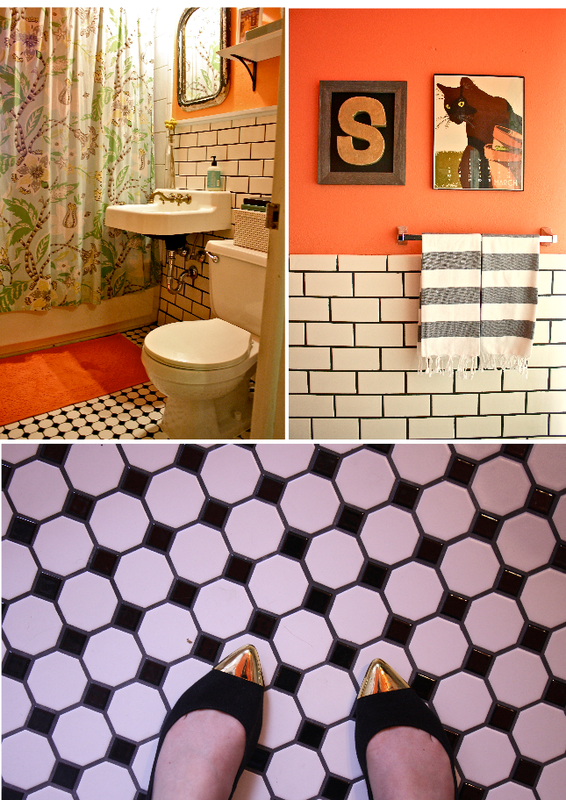 Those black and white tile floors are pretty much my favorite thing ever; love their vintage feel. 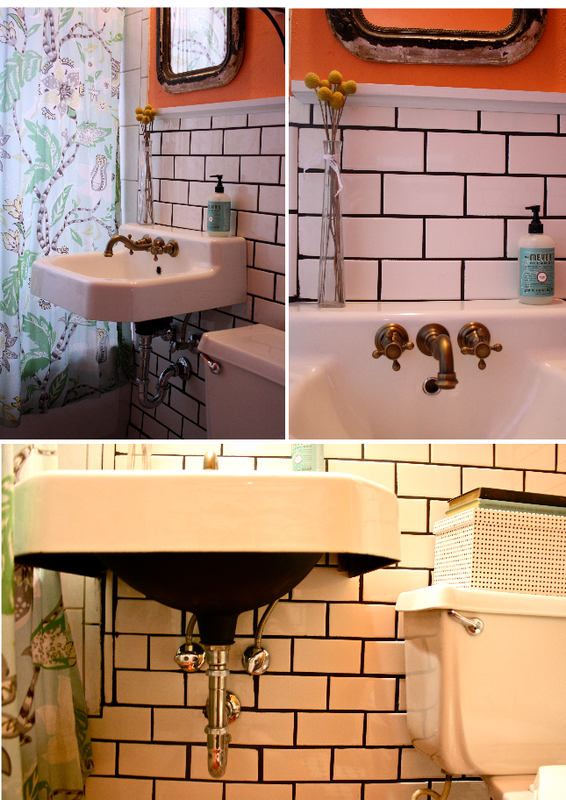 And I love how they play off the new white subway tile with black grout. Everything just kind of pops. It looks fresh, but a little old at the same time. Just how I like it. 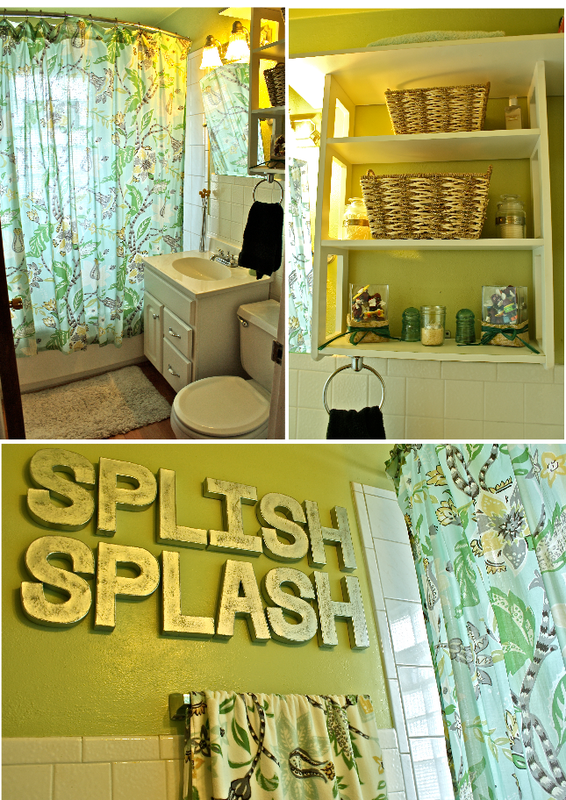 So, obviously what we were going for here (besides a fun style switch-up) was to make the space feel just a bit bigger. Like I've mentioned about 40 times, this is a bitty little bathroom and it was easy to feel suffocated in there. So the most important piece of the puzzle was finding a wall mount sink. We found ours for $25 at the ReStore, then purchased a brass/bronze finish faucet to go with it. I think the brass/bronze finish makes everything look even more vintage, especially with that goose-neck faucet. I'm considering trying to finish the drain trim in a matching brass/bronze color, if possible. I also spray painted the bottom of the cast-iron sink a matte black. You really can't notice it unless you're looking for it (or on the floor...which I'm hoping is an experience I won't be having too often), but I really like that little detail. Is it weird that my favorite part of the whole bathroom is the new toilet-paper holder? Bought it for $10 off eBay and it's basically the most fun old-school detail a bathroom can have. Another simple detail change was the spray painting of the air return. I thought a matte black (same as under the sink) would really pop against the white tile. Makes think of the '50s. So, you've already learned the story of the mirror, but we desperately needed a new light fixture above it. Our old one was waaaaaayyy too grandma-style. We looked all over the place for a light fixture we liked, but unfortunately my taste calls of $900 lights from Electric Schoolhouse Co. However, one day we were at Home Depot and notice we really liked the exterior sconces more than any bathroom lights...so we picked one up in a brushed nickel finish (for something like $30), then gave it that same matte black spray-paint treatment that we did with the sink and air return. 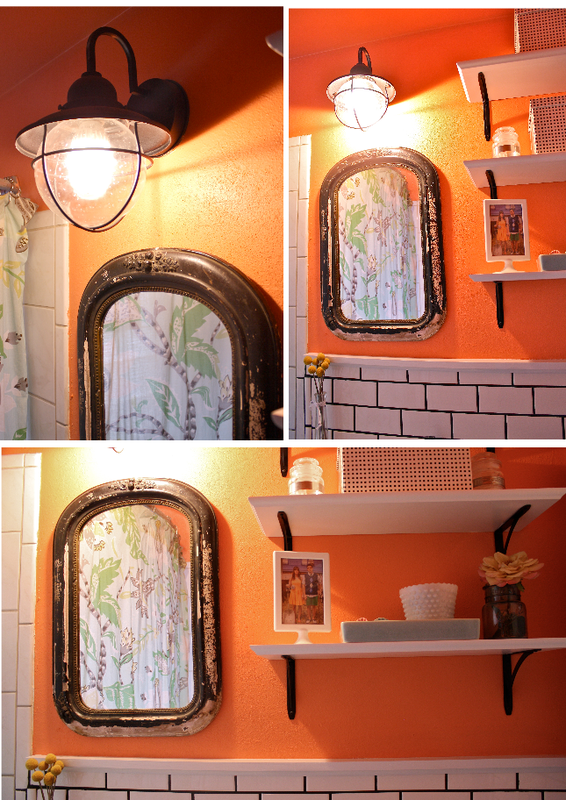 I also really love the little wooden ledge one the wall under the mirror and shelves. I just love bathrooms with this detail and really wanted a little ledge of my own. Eric thought it wasn't necessary, "What are you even going to put on it?" My incredibly convincing response: "Well...like...little things!" It's about an inch wide, so I won't be able to fit much up there, but I'm going to find little things and they are going to live on that cute little ledge, alright? I will prove its worth. Because we lost a lot of storage space when we removed the vanity, all our things have to be tucked away into boxes, which we've got on our vertical shelves above the toilet. I found these black and white boxes at Target and thought they fit the space perfectly. Inside the boxes we've got all our little things like Eric's electric razor, my Clarisonic, extra toiletries, etc. For some weird reason I love the two old books sitting atop the box resting on the toilet tank. They just kind of pull everything together. Plus, maybe their placement will actually encourage the reading of Escape to Xanadu and Great Epochs of American History. Speaking of details, I had fun populating the shelves with functional items, and also more little details. Obviously I got a kick out of putting our "American Gothic in the Cow Palace" engagement photo in the bathroom, just above the toilet. We've got a shovel and a pitchfork just in case things....happen. So let's talk about some things I'm unsure of. First of all, I'm definitely swapping out that shower curtain. 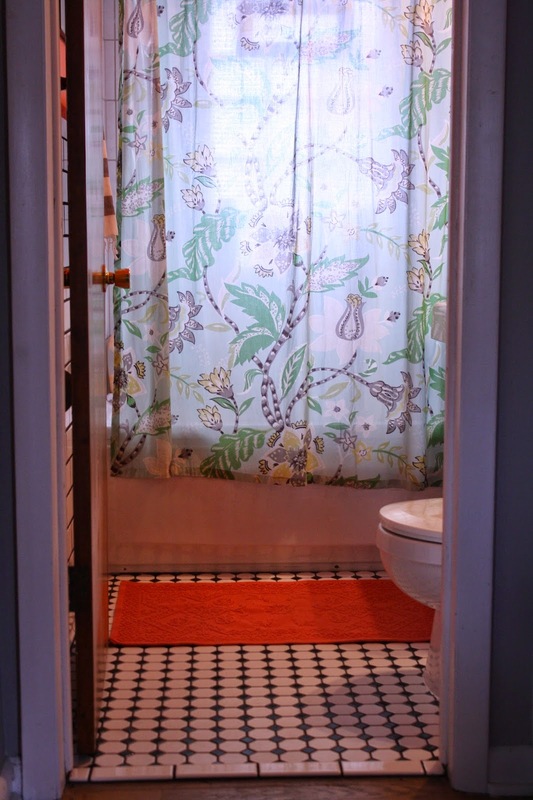 It's organic, floral pattern just doesn't go with the new, vintage feel of the space. It makes me sad to retire it, because I honestly love that curtain, but it's just not working. I'll be looking for one a little more simple, maybe with a more geometric pattern or a bit of a masculine/minimalistic feel to offset the coral color on the walls. Secondly, way back in the beginning of the year, I bought that coral bath mat at Anthro from their clearance section. It is literally the exact color of the walls, so I thought it would be perfect for the room, but once I put it in there I wasn't totally convinced. Hmmm....what do you think? I'm so torn on this. I don't want the room to scream, "Hey! Did ya see all the coral in here? Well, if you missed it on the walls and ceiling, don't worry your sweet heart 'cause there's more right here on the floor!" Anyway, I could use your input. I think I like it...but what if I'm wrong? (This is some Gretchen Wieners type uncertainty, here). I don't know what other color bath mat I could incorporate. White would look great, until one week later when it gets dingy and looks gross against the bright-white tile. And black wouldn't be bad, except for the fact that we have two furry cats who just happen to love hanging out in the bathroom. Alright, enough looking at the bathroom. Let's wrap it all up. I'll update you with all the little tied ends and wrap ups once I get them done. Thanks for being patient these last 12 weeks while things went slow as molasses. As I mentioned above, I'm just happy it's all over, and things look lovely, fresh and just a little old school. It fits our 1950s-era Cape Cod just right. Thanks Ashlae! I wasn't sure if the bath mat was just a little *too* perfect/matchy-matchy (I tend to lean toward eclecticism), but I'm getting thumbs up on it from all sides so I think it's got to stay. Hey, I saw your place on Apartment Therapy (or was it Design Sponge?) and if your new place will be anything like that space, you are golden. P.S. Shoes were a whole $5 on clearance at Old Navy. Magically, still haven't managed to scuff 'em up in the two months I've owned them. 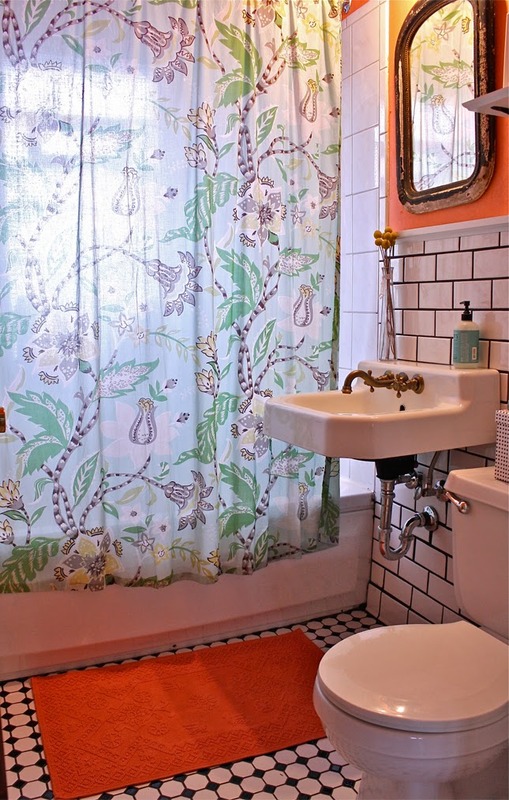 I think a neutral bathmat/shower curtain could work well (maybe something of the beige or grey variety), since the walls are so bright. Looks awesome though! And I LOVE the light fixture! :) I bet you are glad it's finally over! Thanks for sharing nice information with us about bathroom construction. i like your post and all you share with us is update and quite informative. Gordon Rutty is best choice if you wanna know more about new designs of bathroom.